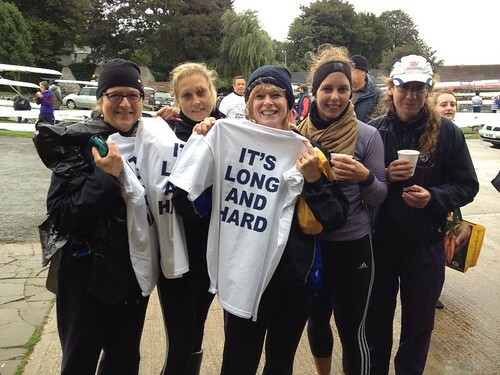 Four crazy rowers from the women’s squad decided to row the Boston Marathon. Me [Anne], Joss, Bailee and Annie. The initial enthusiasm dwindled a bit and after nearly having an VIII, in the end it was just a IV. The plan took on more seriousness once Robert had agreed to cox it – and even though he had asserted he would only cox an VIII, he was not surprised to find a IV. We were enormously relieved to get a place on the Emma trailer towed by Ian with Champs W1. This spared us the logistical nightmare of towing our own boat and needing to leave the boat in Lincoln, the trailer in Boston and get the trailer driver back to Lincoln. When the draw came out we were boat number 6 going off at 9.06am. This meant a very early start from Cambridge. So early in fact that we decided to stay in a hotel on Saturday night and spare ourselves a 5am start. We found ourselves a 2 bedroom cottage right in the centre of Lincoln which was very comfortable. Bailee and Annie shared one room and me and Robert the other. We got Robert a Z bed. Apart from drying out damp coxing kit from his many outings with City (there’s not accounting for taste) which began to smell of wet nappies he was a very well behaved roommate. The smart amongst you will realise we were missing one crew member. Joss. She had been having the week from hell at a conference in Manchester that only ended on Saturday – the day before the race. In fact, as four of us drove to Boston, Joss was still in a coach travelling from Manchester to Cambridge. Fortunately, Mel agreed to drive Joss up on Sunday morning and we were very pleased to see her arrive. The early start proved to be a cloud with a silver lining as at 9am it was dry, calm and a sensible temperature for rowing. There is a very steep bank down to the start, where the officials from Boston RC cheerily told us ‘it’s very slippery!’ (Hey, why don’t you put some grit or sand on the bank edge). It was. There are lots of Masters’ scullers in this event who could easily have ended up needing a hip replacement. We had set ourselves a target of 5 hours to row the event. We started at a comfortable rating of 22spm. Every kilometre is marked along the course and we began ticking them off at a good rate. We had a ‘push for 5’ at every kilometre mark which stopped us slipping back on the power and rating. We pushed Lincoln Cathedral good bye, and made Bardney Lock in good time. I have to say we made a brutally efficient transfer through the lock. Shoes on; back packs on; just picked up the boat with blades still attached; and hand bagged Spare Rib over – to another slippery landing dock. And we were off again. The weather was still quite reasonable at this point. Clearish skies, cool but comfortable, but clouds were forming. We reached the halfway mark at about 2 and a half hours. All good. A slice of malt loaf every 10 kilometres – worked well for me. And then the wind started blowing from the south. In fact it came straight at us. Poor Annie in the bows took the brunt of it. You could feel the wind on the square blades blowing us back to Lincoln. The time between the kilometre marks began to increase. 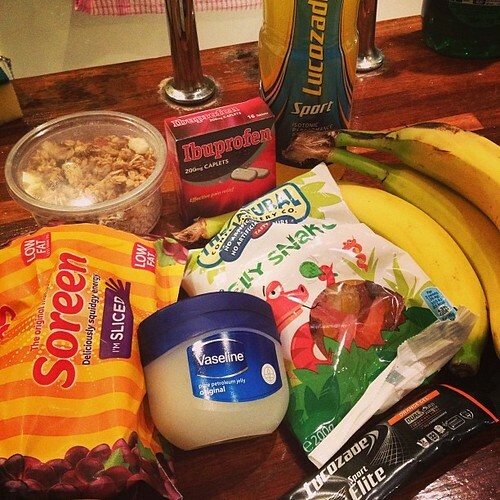 I could also tell that something wasn’t right with Joss – and when she asked for ibuprofen, I got worried. It turned our afterwards that she had a very painful hip. She started leaning away from her rigger to ease the pain. Sitting at 2 there was not much I or any of us could do to help her. Robert later confessed that this was also his ‘dark’ moment in the race probably as weren’t rowing very well. Our timing slipped so that bow pair and stern pair were not quite together. Ooops. And we all realised in our own little bubbles that were not going to make our 5 hour target. However, as committed rowers, we were going to make the best of it. We kept pushing through the wind and now waves. We set ourselves targets of catching certain boats ahead and holding off boats behind as they came into sight for a certain amount of time. The temperature dropped and I was rowing in my splash top – something I almost never do even in an outing. It was cold. It drizzled too which was not good for my purple glasses. We used our weed hook 3 times. Thanks to Andy S for advising us to take one. For me the worst bit was 30 – 40 km. From 40km we could sense the end and the tempo picked up again. At 45 km Robert visualised an outing from Baits Bite back to Queens’ boathouse which we all appreciated. I was not impressed when the tannoy announced our arrival with ‘and this crew set off at 9am so they have been rowing a very long time’ – well actually for a novice coxed IV the course record was 5.02 hours, so coming in at 5 hours 33 was pretty decent given the howling gale. We rowed in strongly and tidily. Ian and Mel met us. Thank you. Our bums were numb. I had a bit of damage to my stroke side hard skin, but nothing to complain about. Desperate for a pee. Delicious bacon roll, tea and cake. Cheeks glowing (both kinds). Yes I would do it again.